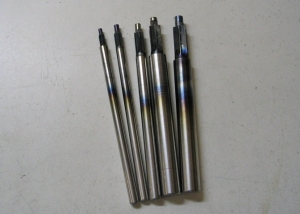 Homemade counterbore cutters machined from oil hardened drill rod. Flutes milled using TiN coated solid carbide end mill. Tool is hardened and tempered, then quenched in oil. Each cutter features 6 flutes. Available in sizes #2, #4, #6, #8, and #10.